I have previously written about the pricing dynamics in the US smartphone market and the potential impact on premium smartphone sales. On this topic, CIRP released an interesting report which showed that higher-end iPhone models were more popular with buyers on financing plans (as compared to those on subsidized plans). This data presents a great opportunity to test my "profit trap hypothesis" and inject some much needed objectivity into this discussion. First, let me give you a brief overview of the hypothesis as it relates to smartphone financing plans in the US. Mt contention is that financing plans and the relative increase in price disparity would have the following effects -- (1) Overall sales volumes of premium smartphones like the iPhone would decline, and (2) The ASP of the iPhone and other premium smartphones would increase. At least initially, the latter would be caused by the best (identity-focused) customers remaining loyal and the worst (utility-focused) customers defecting to cheaper offerings. For example, a customer who buys an iPhone 5S for $199 subsidized could pay more to buy the same device on an unsubsidized financing plan, but a customer who buys an iPhone 4S for $0 subsidized would probably switch to a cheaper device on a financing plan. On the face of it, CIRP's data seems to support my hypothesis. However, the hypothesis is a combination of (1) and (2), while CIRP's data just supports (2). Since the hypothesis challenges the established position (iPhone sales will remain unaffected), the burden of proof lies with me. To test my hypothesis, I also need to find data comparing overall subsidized iPhone sales with financed iPhone sales (preferably from the same source). Fortunately, CIRP's report from February 2014 gives us just that. CIRP's report, titled "Phone Buyers are Rational", compares the split of subsidized smartphone sales with financed smartphone sales across brands and platforms. Unfortunately, the text (and the tone) of the report conveys one set of data, but the chart in the report shows an entirely different picture. Among operating systems, Android phones account for 61% of financed phones. In comparison, Android operating systems have a 51% share of the US market in the survey period. T-Mobile helps increase Android's share, as 71% of T-Mobile activations are Android phones. 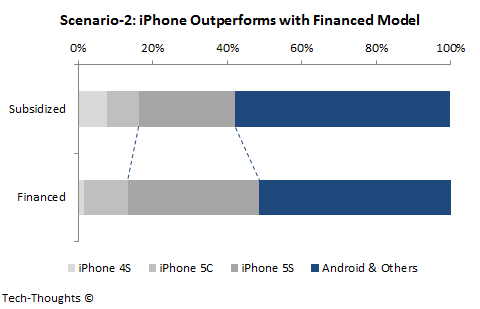 As we can see, the chart shows that iPhones have a ~48% share of financed smartphone sales. But the text says that Android has a 61% share of financed smartphone sales, leaving just 39% for the iPhone and other platforms. It is important to note than not all financed sales are unsubsidized -- Verizon and Sprint also offer financed plans, but pricing is still opaque (subsidized). On the other hand, AT&T and T-Mobile offer financing plans with unsubsidized and transparent pricing. It's possible that one data set measures the AT&T/T-Mobile model and the other measures the Verizon/Sprint model. For the purpose of this post, let's keep things simple and assume that all financing plans are equivalent to unsubsidized plans. To be fair, I've considered two different scenarios -- One based on the text of the report and one on the chart. I've also ignored CIRP's "T-Mobile only" data as it is quite obvious that it supports my hypothesis in both scenarios. As we can see, this scenario confirms both parts of my hypothesis. The iPhone's share of financed smartphones (comparable to volumes in a flat market like the US), is about 12% lower than subsidized smartphones. The iPhone 5S and 5C saw small declines, but the iPhone 4S virtually collapsed. This scenario categorically rejects part (1) of my hypothesis. While the iPhone 4S's share of financed smartphones declined, it was more than made up by gains for the iPhone 5C and 5S. 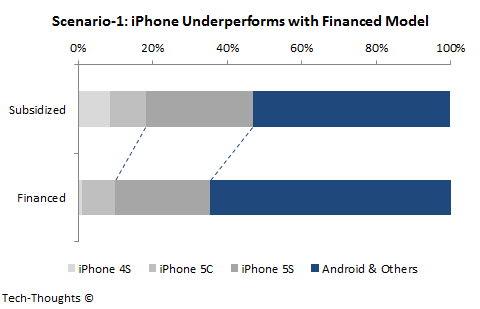 Overall, the iPhone's share of financed smartphones increased by 6% as compared to subsidized smartphones. While data from both Kantar and StatCounter leads me to believe that my hypothesis is accurate, this analysis could certainly confirm or make me question my convictions. I'll to leave it to readers to go through my analysis (which I believe is extremely conservative) and the linked reports/data to make up their own minds. The goal of this exercise was not just to crunch numbers, but also to inject some objectivity into this discussion. With a few exceptions, most analysis related to Apple (or Google for that matter) seems increasingly polarized. On one end of the spectrum you have the "iPhone is doomed" group that believes "Apple has 60 days to produce an iUnicorn". On the other end you have those who treat Apple's competitive advantage as a sacred cow that can never be questioned. In this environment, it is incredibly difficult to have a discussion without catering to or being associated with one of those two groups. Hopefully, we see more interesting analysis and fewer knee-jerk reactions going forward.